Finding the medical franchise opportunity will give you the chance to invest in your future and your community. 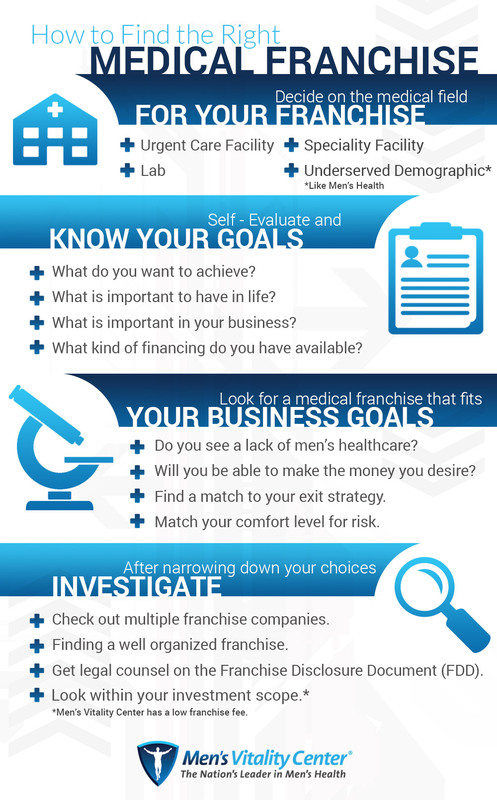 This infographic offers a strategy to find a healthcare franchise that will be the best fit for you so you can have the best success. It takes researching your options and what would fit for your financial availability, business goals, culture and comfort level for investment risk. Men’s Vitality Center provides healthcare for men. Historically, this is an underserved population who don’t visit the doctor until they have to. At Men’s Vitality Center, we are working turn this around. Imagine owning a medical franchise that helps men address their medical issues early on so they can stay healthy longer. Contact us to learn more about our franchise.